Created for blues ace Eric Gales, this hybrid amp promises huge clean tones from a box the size of a sawn-off cereal packet. One day, shaggy-haired scientists will invent a guitar cabinet that sounds exactly like a 4×12 but folds away into a Gucci handbag. Until then, for those of us who need to move more air than a lightweight 1×12 combo can manage, the only answer is to keep on lugging around the usual multi-speaker spine-warpers, and do our best to make life easier by pairing them with smaller and smaller heads. DV Mark may well be able to help us with this mission. This is, after all, the sister company of Markbass, whose ultra-compact bass amps did the four-string fraternity such a game-changing favour a few years ago by sounding more fantastic than had previously seemed possible from such a small footprint. 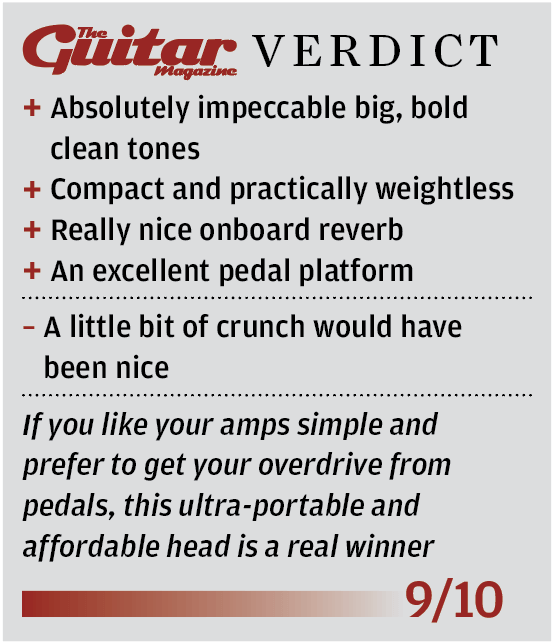 The guitar head market might not be quite so ripe for revolution, but the ‘Raw Dawg’ EG has a clear ambition to set a new standard in performance per kilo. A stripped-down head that weighs in at under 3kg, its solid-state output stage – DV Mark’s own proprietary MPT type – claims to belt out 250 watts through a four-ohm cab, or 150 watts through eight ohms. However you choose to reduce that figure to come up with a rough valve equivalent, this should be loud enough for pretty much anyone in 2018. And it isn’t even entirely tubeless: there’s a 6205 subminiature valve on preamp duty. So, what does the ‘EG’ stand for? Assuming you’ve been shrewd enough to hold onto your back issues of the world’s most indispensable magazine, pull out March 2017: in there you’ll find an interview with Eric Gales, hailed as a prodigy at the age of 15 by none other than Carlos Santana. Raw Dawg is his nickname – also found on his signature Magneto guitar – and this is the amp he came up with in collaboration with DV Mark supremo Marco De Virgiliis. If you’re wondering where the gain control’s gone, you’d better look at the floor – this thing is all about clean power and headroom, and any overdrive is going to have to come from your pedalboard. So we just get a single volume knob and a three-way tonestack, plus a control for the onboard digital reverb. The knobs themselves are something like chickenheads but, to keep things in scale, smaller and stubbier. Can we call them budgieheads? There’s a footswitch input for bypassing the reverb, but a standard on/off type won’t do – you’ll want a double switch with a TRS plug, as there’s also a mute function hiding in here. That might not be at the top of everyone’s dream feature list, but it could prove useful for mid-gig tune-ups or guitar swaps. Round the back we find a cooling fan, an effects loop send and return, a DI output with switchable 6dB attenuation, and a pair of speaker outputs: one jack and one Speakon. This latter is clearly a hangover from the Markbass line – we’re sure there is such a thing as a guitar cab with a Speakon connector, but you may have to swim to the bottom of Loch Ness to find it. Anyway, a quarter-inch jack will plug into the central part, so you do effectively have two standard outputs available. We’re not big fans of fans – they’re never quite silent, and so need to be kept away from mics – but the whir from this one isn’t going to bother anyone at gigging levels. The operating noise floor of the amp itself is impressively low when we start strumming at ‘only just on’ levels, and it doesn’t take long to discover this is a fine-sounding head. The emphasis is on big, spacious, blooming bottom end – there’s plenty of this going on through every speaker cab we plug the Raw Dawg into, and for a well-balanced tone we soon find ourselves pulling the bass down to nine or 10 o’clock and pushing the treble up to two or three – but that’s not to say the top end lacks sparkle. A Telecaster’s bridge pickup cuts through beautifully, as does the twinkly cluck of its middle position, and everything has a sticky sweetness that’s quite addictive. As there are only five controls, it’s just as well they each earn their keep. This is especially true of the mids knob, which allows for thumpingly solid tones when pushed high and glassy shimmer when dialled back. You’re never far from a pleasingly pure tone with this amp – and that goes double when you whack up the volume. We often talk about valves in relation to the warmth of their overdrive, but it might well be that the 6205 in here is playing just as vital a role in lending depth and realism to tones that are virtually distortion-free. Oh, and if you are worried about that solid-state power amp’s ability to generate sheer loudness, don’t. With the right cab, this thing will knock the heads off granite statues. The reverb is provided by an Accutronics module that, according to the maker’s own specs, is a straightforward substitute for a spring-driven unit. It certainly does provide plenty of springy texture, but there also seems to be a hint of modulation in there – and we’re not complaining, because it sounds great. Whether it’s the right kind of reverb for straight Chicago blues is another matter, but you’ll get good results from this amp playing many other styles of music – and we’re sure Eric won’t mind.